Article 86 mentions the appeal of Ancaster regarding Dr. Jitse van der Meer. The discussion on that Tuesday was held in closed session. We can skip ahead to Day 7 and article 103. There we find that the decision in this matter is only going to appear in the confidential Acts. And what happened to the Providence appeal? It doesn’t appear again anywhere in the Provisional Acts. I suspect that it might appear in the final, public version of the Acts. We will have to see. The matter of women’s voting was certainly something of interest at this Synod for a lot of people. There’s a long history on this topic in the Canadian Reformed Churches. It took a long time for the momentous decision at Synod 2010 recognizing that this is a matter for local churches to decide upon. Synod 2010 left it in the freedom of local churches whether or not they wanted to allow female communicant members to participate in elections for office bearers. Numerous churches appealed that decision to Synod 2013 and it was overturned. By then the horses were already out of the gate. Churches that had been doing it since the decision of Synod 2010 continued doing it in the conviction that this was not agreeable to Scripture, Confessions, and Church Order. More appeals were submitted to Synod 2016. Consequently, this most recent Synod decided that Synod 2013 erred in its overturning of Synod 2010 on this matter. Confused yet? Let me make it simple: the Canadian Reformed Churches are back to where they were after Synod 2010. Whether female communicant members vote or not is a matter for local churches to decide. My view on this has not changed. I remain convinced that there are no sound biblical, confessional, or church political arguments that can be brought to bear against allowing female communicant members to participate in elections for office bearers. I understand that some local churches believe differently about it and thus I think the approach of Synod 2010 (buttressed now by GS 2016) is the best approach — really, it’s the only approach that can be justified. I would urge readers to look carefully at the arguments presented by GS 2016 in the Acts. For this post, I am going to open up the comments. If you want to argue the case for the opposing view or make other comments, I’m giving you the opportunity. However, please don’t expect that I’m going to interact. Article 90 dealt with another topic relating to the role of women in church life, but this time in the Reformed Presbyterian Church in North America (RPCNA). The Committee for Contact with Churches in North America (CCCNA) recommended that the CanRCs offer ecclesiastical fellowship to the RPCNA. This despite the fact that the RPCNA allows for women to be ordained as deacons. 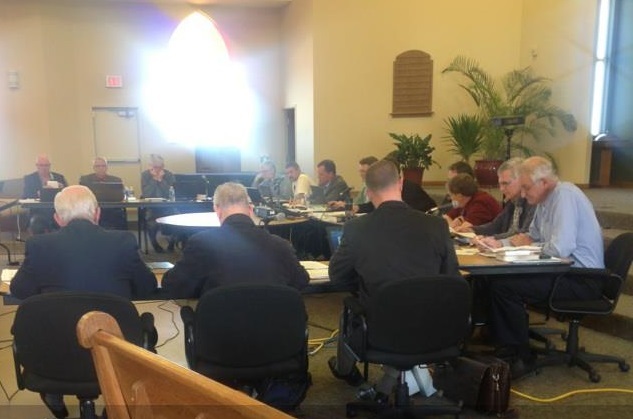 The CCCNA pointed out that the RPCNA doesn’t consider the deacon to have “an office of ruling authority.” Contrary to the CCCNA’s reasoning, Synod Dunnville decided that the RPCNA’s view on this matter did, in fact, constitute a significant obstacle to EF. After all, article 30 of the Belgic Confession says that faithful men are to be deacons. Moreover, they said (Consideration 3.2.3) that the office of deacon does “involve the exercise of authority in the church.” It appears to be the end of the road for any possibility of formal relations with the RPCNA, though informal interactions will continue through venues like the North American Presbyterian and Reformed Council (NAPARC). CanRC Synod Dunnville is coming up in May. I just noticed this press release from Classis Central Ontario of March 11, 2016. It was not a very eventful classis, but the press release does note that every single church in that classical district is appealing the decision of the last CanRC Synod on women’s voting. I’m quite sure that there are other churches across the country doing the same. Will Synod 2016 reverse course? It will be very interesting to watch. Our Synod finished its business last night. Not all the Acts have yet been posted, but they should be soon. Today I’ll make some comments about a few matters found in articles 113-134. In article 122, there are some noteworthy decisions regarding the CanRC edition of the Heidelberg Catechism. As mentioned here, the Standing Committee for the Book of Praise proposed a change to QA 115. Synod decided to leave well-enough alone. However, there were also a few changes proposed by one of the churches and a couple of these were taken over by the synod. Answer 10 says that “He [God] is terribly displeased with our original sin…” It will now read, “He is terribly angry with our original sin…” In Answer 75, “everlasting life” will be changed to “eternal life” in order to make it consistent with Answer 79. The matter of women’s voting came up again in article 125. At Synod 2010, the Fellowship CanRC in Burlington appealed a decision of Regional Synod East on whether or not this issue was a matter of local regulations. Synod 2013 decided that Synod 2010 erred in the way it handled that matter. Synod 2013 then proceeded to deal with the appeal and denied it. It reaffirmed that the issue of women’s voting is in fact a matter of the churches in common and not a matter for local churches to decide by their own regulations. However, perhaps the most interesting items in these acts are found in the articles dealing with the United Reformed Churches. From a superficial CanRC standpoint, the process is continuing. Our committees were all reappointed. Our church unity coordinators were also mandated to urge the URCNA to reappoint all their subcommittee counterparts. Should those counterparts be reappointed or mandated with a call to engage the CanRC subcommittees, we will be ready and waiting for them. But…there is a fly in the ointment here and it’s not a tiny one. In article 126, in the “Considerations,” one can find interaction from some of the churches with the report of our Coordinators for Church Unity. URC brothers who are paying attention will undoubtedly read some of this with concern. Three local churches wrote letters to our synod stating that “some points of Federal Vision can find sympathy in the Canadian Reformed Churches.” One church wondered whether the URCNA “has a clear picture of the Federal Vision movement.” Though for the sake of honesty and transparency it’s necessary that these sentiments be expressed, I deeply regret that they live in our federation. At least now the URCNA will have a clear justification for their concerns about pursuing full federative unity with us. There are now official CanRC documents stating that there is sympathy for “some points of FV” in our churches. One church wonders whether our brothers in the URC even understand the FV — that despite the fact that they’ve been engaging it and studying it at length for over a decade. Let’s be realistic: a merger in my lifetime is now certifiably a pipe dream. If it happens, it will be nothing short of miraculous. Moreover, those of us in the CanRC who are concerned about FV clearly have our work cut out for us. The same article also has some more discussion about the status of the Nine Points of Schererville and the Fifteen Points of London. Some of our churches continue to be concerned about the status of these points in the URCNA. Our Coordinators have been mandated by this synod to get more clarity on that point, while at the same time discouraging the URCNA from “making further statements of this nature.” Does anyone else see the problem there? We need more clarity on what these points mean to the URCNA, but we also urge them to stop making statements “of this nature.” The nature of these points is unclear — that’s what the CCU is mandated to clarify. How can we urge them to stop making statements like this until we have a clear understanding of the nature of these statements? Over the last few years, I’ve not been hopeful for the prospects of federative unity between the URCNA and CanRC. Today I’m disappointed to say that I’m even less so. Whatever momentum we’ve had in the last few years is likely to be torpedoed by what our URC brothers read in the Acts of Synod Carman 2013. This grieves me and, even more importantly, I can’t believe that this would be pleasing to the Lord. Synod Carman 2013 — photo courtesy of Rev. D. Boersema. As Phil Robertson would say, “Now we’re cooking with peanut oil.” There are several very interesting items in yesterday’s Acts. Synod made a decision about Bible translations. The ESV is now the recommended translation in the Canadian Reformed Churches, having supplanted the 1984 NIV. Synod refrained from recommending the NIV2011 for use or testing in the churches. However, the Committee for Bible Translation was tasked with doing further study of both the NIV2011 and the ESV. There were a number of decisions pertaining to the Book of Praise (with more to come). One of the decisions was in regard to the Abbreviated Form for the Lord’s Supper. I predicted that the recommendation of the Committee would be followed and the words “For the Second Service” would be dropped. It didn’t happen. The Synod decided to keep the words, citing as grounds the fact that the Committee still needs to interact with the reasoning of Synod Smithville 1980. 4.1 That Synod Burlington 2010 erred on church political grounds in its decision to leave the matter of women’s voting in the freedom of the churches. 4.2 That Synod Burlington 2010 erred in stating that the exegetical sections brought forward in both the majority and minority reports are “hardly relevant or decisive for the matter of women’s voting”. 4.3 That the churches should return to the voting practice as it officially was before 2010, namely, male communicant members only voting. This decision doesn’t affect our congregation in Providence, but I can think of some who will not be happy with this. This issue is not over, not by far. Every three years the Canadian Reformed Churches have a synod. This is our broadest assembly. Since we are allergic to hierarchy and since we respect the position of the local church, our synod is not the highest assembly. Yet important decisions are made at our synods that have a bearing on all our churches. We agree to accept the decisions of our synods as settled and binding unless they are in conflict with Scripture or the Church Order. This year’s synod is going to be held in the bustling metropolis of Carman, MB, convened by the Carman West Canadian Reformed Church. Over this coming week (and maybe into next) I want to survey some of the items on the agenda and offer some thoughts on where things might go or where they should go. And no, I’m not delegated to this synod. If you see a Bredenhof on the list of delegates, that would be my cousin, Rev. Reuben Bredenhof, pastor of the Pilgrim CanRC in London, ON. Let’s begin with one of the controversial matters being appealed. Synod Burlington 2010 decided to grant churches the freedom to allow female professing members to vote for office bearers. They did not impose this on the churches, but simply opened the door for it. To my knowledge, only a handful of churches have exercised that freedom. Looking at the second provisional agenda, there are at least eight churches appealing this decision: Smithville, Calgary, Carman-West, Dunnville, Carman-East, Grand Valley, Chilliwack, and Coaldale. I don’t have the actual appeals, so I can’t comment on the strength of their arguments. The only thing that might be said is that it is very hard to put the horses back in the stable once they’ve been out and running for three years. Even if Synod 2013 were to sustain these appeals, some local churches have already been implementing this practice. In the scenario where the appeals are upheld, over the next three years these churches with women voting would likely continue their practice and then submit appeals themselves to Synod 2016. This thing could go back and forth for a while yet. However, I don’t see that happening. Since the decision did not impose the practice on the entire federation, churches that object are free to continue doing what they’ve always done. Churches that think differently can also do what they think is right. We will have to learn to live with different practices in our federation. My guess is that the appeals will be denied. I wrote some reflections on the decision of Synod 2010 over here and after three years, I think the same.